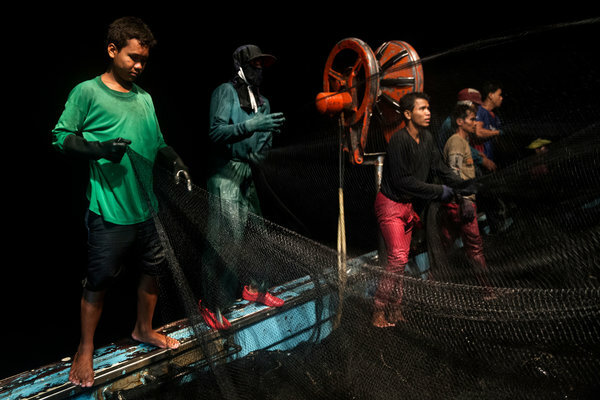 Shocking revelations about the international fishing industry’s reliance on slave labor have caused many people to question the origin of the shrimp or tuna they eat. The disclosures have also led the United States to take some important new steps to clamp down on the use of indentured workers and discourage other unlawful activities on the high seas. In another useful move, the National Oceanic and Atmospheric Administrationthis month said it would improve how seafood is tracked from catch to market by imposing new reporting requirements on American importers, who purchase from overseas sources 90 percent of the seafood that humans and pets consume in the United States. These new requirements would affect 16 species, including cod, snapper and some tuna, and are intended to protect species that are overfished or at risk of being overfished by cracking down on illegally caught or mislabeled fish. Meanwhile, two international trade unions have filed a complaint with the United Nations labor agency about seafood from Thailand processed by slave workers. The Thai government said it was installing satellite tracking devices on fishing ships and requiring additional reporting of which workers get on and off ships. These and even stronger reforms are urgently needed to respond to the dark side of a multibillion-dollar industry that employs more than 650,000 people in Thailand alone. Thailand has long been judged by the State Department to be one of the worst slave labor offenders. A series in 2015 by The Times’s Ian Urbina provided searing details about forced labor on Thai boats and chronicled the lives of several dozen Cambodian migrants, most of them boys, who worked on the ships but are now free. As the series made clear, lawlessness on the high seas goes beyond slave labor and illegal catches. Murders are committed with impunity, ships dump huge quantities of oil and sludge, and gunrunning is frequent. These problems are interrelated and must be addressed in a comprehensive way.